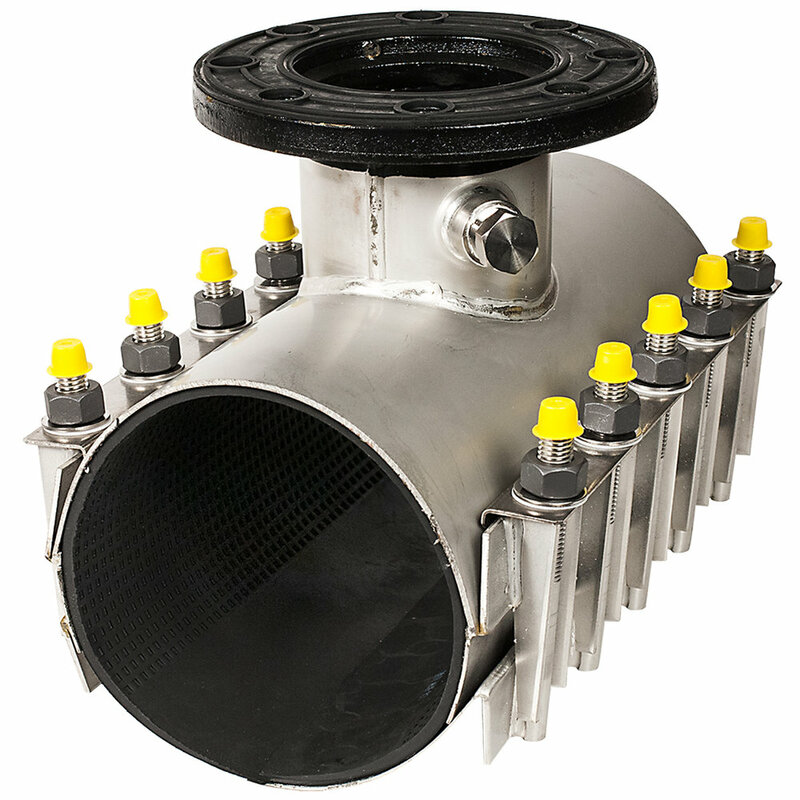 Fabricated steel tapping sleeve with triangular side bars and drop-in bolts. Meets requirements of MSS SP-124 and AWWA C223. SIZES 6" - 42" Larger sizes available upon request. OUTLET SIZES 3" - 42"
COMPATIBILITY Steel, cast iron and other types of pipe. WORKING PRESSURE 6" - 12": up to 250 psi; 14" - 36": up to 150 psi; 42" and larger: up to 100 psi. For higher pressures, contact your representative. BODY ASTM A36 steel or equivalent unless noted. FLANGE AWWA Class D Steel Ring Flange, compatible with ANSI Class 125 and 150 bolt circles, are standard. Other flange styles are available. 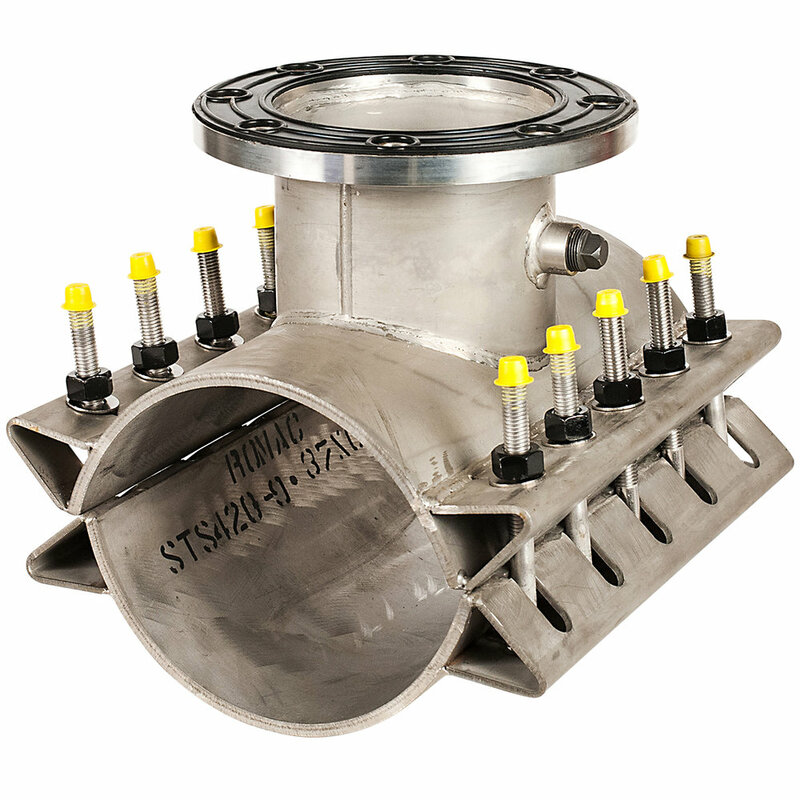 Designed to fit tapping valve lip per MSS SP-60 where applicable. TEST PLUG ¾ inch NPT type 304 Stainless Steel. Plug threads coated to prevent galling. FLANGE GASKET Gaskets 3” through 12” full face proprietary gasket are made from Styrene Butadiene Rubber (SBR) compounded for water and sewer service in accordance with ASTM D 2000. Other compounds available for petroleum, chemicals, or high temperature service. OUTLET GASKETS 3” through 12” size on size SBR wire reinforced. Larger than 12” size on size are Nitrile Butadiene Rubber (NBR) compounded for water and sewer service in accordance with ASTM D 2000. Other compounds available on request. COATING Fusion bonded epoxy in accordance with AWWA C213.